As well as the super fun Rum Cocktail Masterclass I went to at the Leamington Spa Turtle Bay, they were also kind enough to invite me and a guest for dinner. I've already harped on about how much I love the atmosphere in there. Which you can read all about in my Rum Cocktail Masterclass post. But seriously, it's just such a cool vibe. As you will know by now, I love going out for food. It's my favourite thing. Infact when my boyfriend said to me the other day that we should have a quiet January and 'maybe not spend so much money on eating out at different cafes and restaurants', the look on my face quickly made him retract his ridiculous statement. But yes, going out for food is the best. Especially when the place serves cuisine you wouldn't eat on a regular basis. We were seated to our table by the most lovely waiter (so mad I've forgotten his name - he was so nice!) and given both the food menu and the cocktail menu. 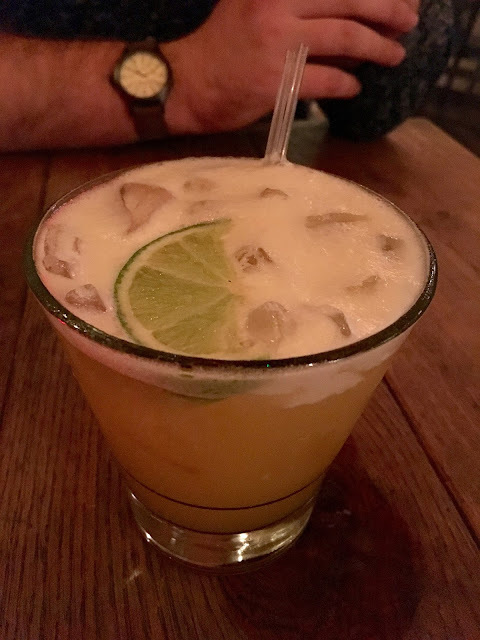 As I am now pretty much an expert in all things Rum, cocktails and rum cocktails, I'd already decided I was having the Mai Tai. H opted for a Red Stripe, always a perfect pairing with Caribbean food. 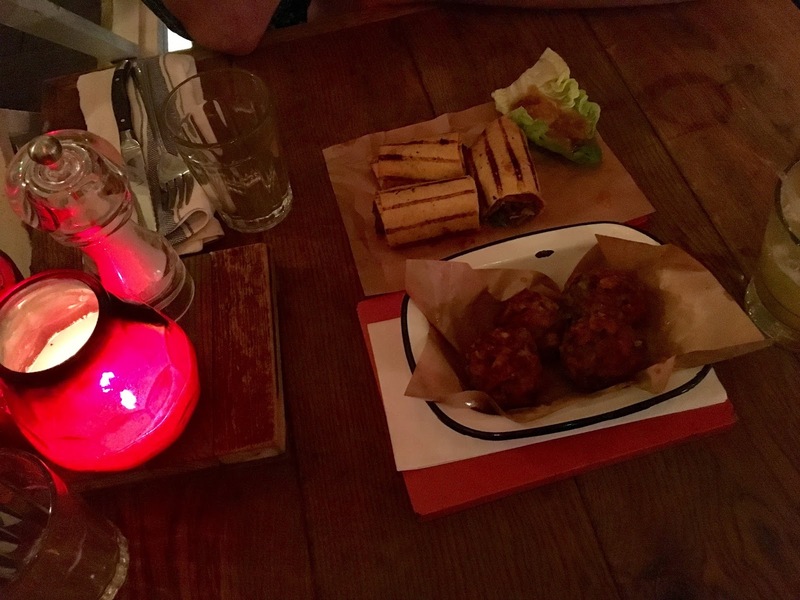 For our starters we decided to share the duck rolls and the sweetcorn fritters. Eating the duck rolls made me feel like I was in an M&S ad...melt in the mouth slow roasted shredded duck with soft onions onion and a mix of tamarind, soy sauce, chilli & sugarcane - the best bit? Dipping them in that amazing chutney. The fritters were great - flavoured with spring onion, coriander and a bit of a kick from the scotch bonnet. After the starters and another cocktail, we were excited to see what was about to arrive next. 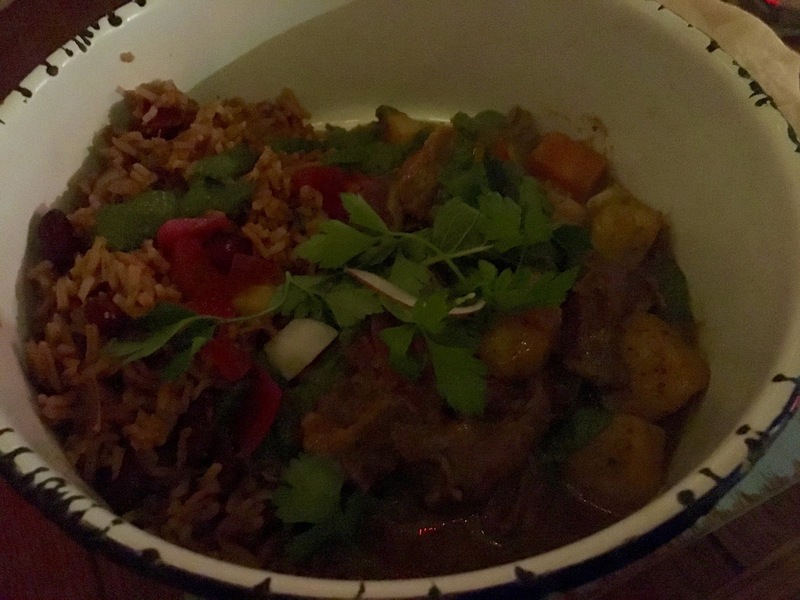 For our mains, H opted for the Trinidad Curry and I decided on the Curry Pork Cheeks. Oh, and a side of sweet potato fries because I'd had some at the Rum Cocktail Masterclass and they were hands down the best potato fries ever. I actually feel a bit envious that I can't make them taste that good at home. 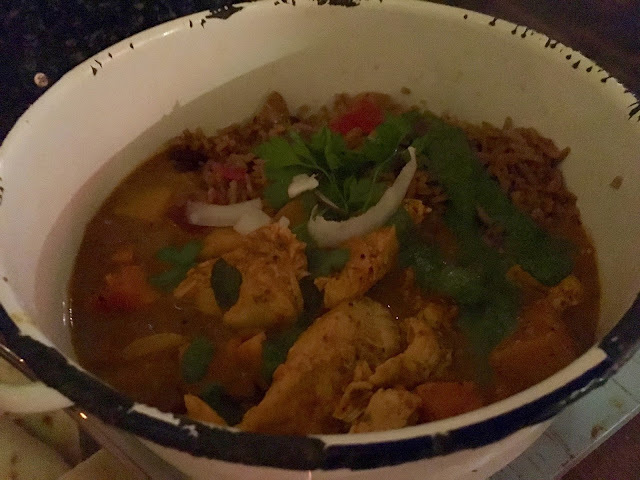 H's Trinidad Chicken Curry arrived and I worried for a minute that I'd got food envy and had ordered the wrong thing...BUT mine looked equally as tasty. The Trinidad Curry is full of spices, coconut milk, mango, garlic and a little kick from scotch bonnet. It's then topped with coconut and served with roti. I had a little try (as I always do) and the flavours were great. The scotch bonnet was more than a bit of a kick for me (admittedly I'm not the best with really really spicy food!) but the flavours were spot on, even if I couldn't handle the level of spice! H absolutely loved it and said if we go again soon, he would definitely have it again. The curry pork cheeks were incredible - they'd been slow cooked in a Carribean spice marinade (which they'd been left to soak up the flavours in for 24 hours) and then cooked in coconut milk with coriander, chilli, garlic, ginger, pineapple and sweet potato. I know you'd expect this from a restaurant, it seems a little obvious, but everything was SO fresh and so full of flavour. I often worry with chain restaurants that, although good, they don't excel to be excellent because they have a certain standard to work to but that is certainly not the case with Turtle Bay in Leamington. You can tell that the food being cooked is not a chore; there's enjoyment for cooking in there! I must admit, it took us ages to eat our mains. The atmosphere of the place made us relax so much that we barely stopped talking to eat but we really enjoyed our meal. 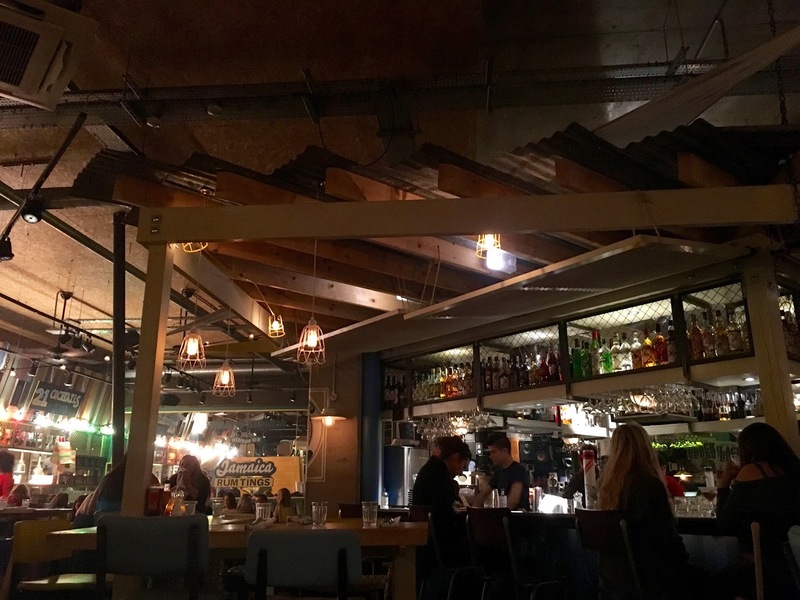 If you're looking for somewhere that's great for a big group, date night, a first date...Turtle Bay has it all. Even if you're just wanting somewhere for a few cocktails, this is the place. They have an amazing happy hour, which is basically all day - apart from between 6.30pm and 9.30pm. I can't wait to go again, genuinely. It is definitely one of the best places I've been in a while for both quality of food, friendliness of staff, amazing cocktails and generally just a really fun and happy atmosphere.